The ChemTek™ range provides the best resistance to the most aggressive chemicals – without compromising dexterity or comfort. ChemTek™ butyl 38-514 & 38-520 offer superior protection against aldehydes, ketones and esters as well as concentrated mineral acids. ChemTek™ Viton®/butyl 38-628 offers superior protection against aliphatic, halogenated & aromatic hydrocarbons (benzene, toluene, xylene), as well as concentrated mineral acids. 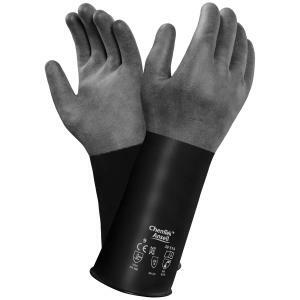 ChemTek™ gloves are surprisingly flexible and provide excellent dexterity. Designed for comfort – with a natural, curved ergonomic shape and soft feel – they offer easy donning and good grip. The absence of latex proteins means there’s no risk of latex allergies.